Biocontrols, biopesticides, biostimulants, oh my! There are a lot of different “biological” products on the market. Frankly, the terms used to describe them can be a little confusing. So let’s take a closer look at a few terms and exactly what they mean. First, what is a pesticide? According to the Cornell Pesticide Management Education Program, “a pesticide is any substance or mixture of substances used to kill pests or to prevent or reduce the damage pests cause”. Pesticides include repellents, but exclude traps (if they are only mechanical or physical). The important point is that pesticides are defined by their purpose, not by their ingredients. Pesticides may be chemicals, plant extracts, or microorganisms, but their purpose is to prevent pest damage. Pesticides are regulated by the Environmental Protection Agency (EPA), and must always be used according to their labels. 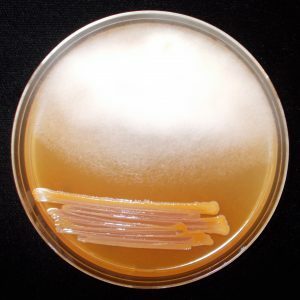 Consuming or parasitizing the pest, directly – An example of this is a beneficial fungus that eats a pest fungus, or a beneficial fungus that infects and kills a pest insect. 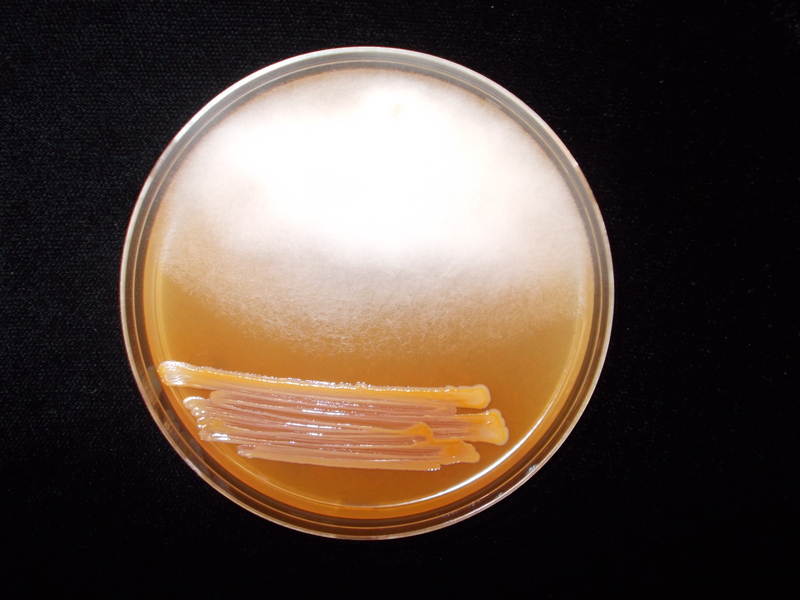 Poisoning the pest – Some microorganisms produce antibiotics that are toxic to pests. There are numerous bacteria that do this. Crowd out the pest – Pest microorganisms (pathogens) can’t colonize and invade a plant if the surface of the plant (leaves, roots, etc.) are already covered with beneficial microorganisms. There just isn’t space. Stimulating plant defenses – Although very different from human immune systems, plants do practice self-defense. Beneficial microorganisms can cause plants to “turn on” their defenses before they encounter a pest. The plant is then less likely to be damaged by the pest. Sometimes a single biopesticide functions in more than one of the above ways. But, again, the purpose of using a biopesticide is to control a pest. Biostimulants have a different primary purpose: enhancing plant health (which can lead to the plant being less susceptible to attack by a pest). The European Biostimulants Industry Council has defined a biostimulant as “containing substance(s) and/or microorganisms [e.g., bacteria and fungi] whose function when applied to plants or the rhizosphere [soil surrounding plant roots] is to stimulate natural processes to enhance/benefit nutrient uptake, nutrient efficiency, tolerance to abiotic [non-biological] stress, and crop quality.” This definition is also supported by the Biological Products Industry Alliance. No regulatory definition of biostimulant currently exists in the United States. Biostimulants are registered either as fertilizers or as biopesticides, depending on the claims (pest control vs. plant health enhancement) made by the registrant. The arrows on this diagram show how different “biological” terms are connected. Text written along the arrows describes the nature of the connection. And where does biocontrol fit in? In several places on this blog, I have noted that definitions of biocontrol vary. 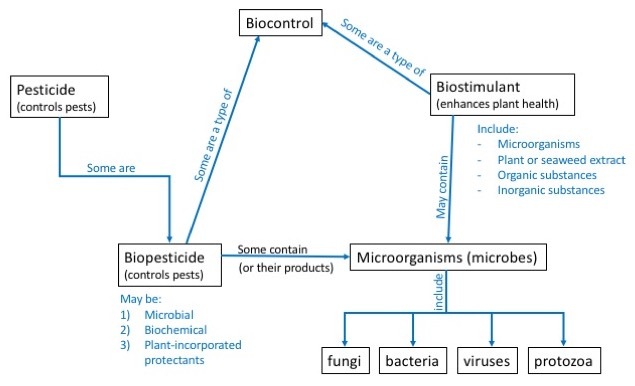 I think most scientists who study biocontrol would agree that a living microorganism that is applied to the soil or to a plant and that consumes or parasitizes a pest (a type of biopesticide) is a biocontrol agent. But there are lots of gray areas. What if the biopesticide contains only products of the microorganism which are antagonistic to the pest, and no living organisms? If a microbial biostimulant enables a plant to more efficiently take up nutrients, making the plant more tolerant of stress (whether from an abiotic source like drought, or a biotic source like a pathogen that causes disease) is that still biocontrol? These are debates I’d rather not spend a lot of time on (at least on this blog). Suffice it to say that at least some biopesticides and at least some biostimulants are also considered types of biocontrol. There are a lot of biological products available to you. Exactly how each is classified (biostimulant versus biopesticide) makes a difference in how the product can be legally used. Know what you are using and why. And always, always, always read and follow the label!